Hispanic consumers are significantly more likely to engage with mobile to manage their finances, with nearly four in five (78 percent) using a mobile banking app, compared to approximately half (51 percent) of non-Hispanics. What’s more, nearly three-quarters (69 percent) of the Hispanic community cite digital as their primary method of banking. 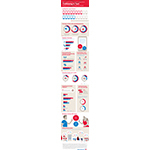 These are new findings released today from the Bank of America Trends in Consumer Mobility Report, exploring mobile trends and banking behaviors among consumers who own a smartphone and have an existing banking relationship at any financial institution. The release of the survey follows the bank’s recent introduction of its mobile app in Spanish. The report reveals similar insights when examining mobile payments. More than half (56 percent) of Hispanics would use or already use their phone to make purchases at checkout, compared to just 36 percent of their non-Hispanic counterparts. 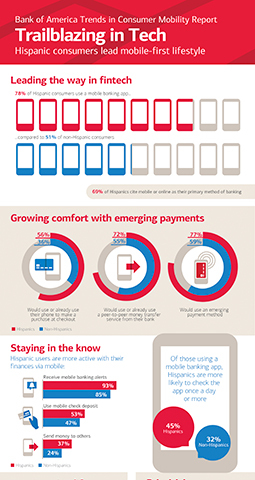 Seventy-seven percent of Hispanics say they’re likely to use emerging payment methods such as mobile wallets and social media apps, with nearly three-quarters (72 percent) citing they would use or already use their bank’s peer-to-peer payments service. Hispanic consumers are significantly more likely to engage with mobile to manage their finances, with 78 percent using a mobile banking app, compared to approximately half (51 percent) of non-Hispanics. What’s more, nearly three-quarters (69 percent) of the Hispanic community cite digital as their primary method of banking. The report reveals similar insights when examining mobile payments. More than half (56 percent) of Hispanics would use or already use their phone to make purchases at checkout, compared to just 36 percent of their non-Hispanic counterparts. Seventy-seven percent of Hispanics say they’re likely to use emerging payment methods such as mobile wallets and social media apps, with 72 percent citing they would use or already use their bank’s peer-to-peer payments service. In examining overall activity, Hispanics are more likely than non-Hispanics to deposit a check (53 percent) and send money to others (37 percent). When it comes to notifications, Hispanics are also significantly more likely to use mobile banking alerts (93 percent), specifically low balance (50 percent) and card charge overage alerts (48 percent). This “always on” mentality is also seen in everyday communications, as Hispanic respondents (35 percent) say they are most likely to interact with their smartphone in an average day more than anyone or anything else, including their significant other (29 percent). They are more likely than non-Hispanics to own more than one mobile device (64 percent), and cite texting (32 percent) as their preferred communications method. Over sharing or fear of missing out? Hispanic respondents also confirmed they are more inclined to share events with others, as nearly all (95 percent) consumers say they want to have their smartphone on hand to capture important life milestones. They’re also more likely than non-Hispanics to post these life moments on social media (78 percent, compared to 69 percent). Conversely, they are also more likely to use their device to avoid social interactions (66 percent, compared to 40 percent), with holiday gatherings (32 percent), family dinners (28 percent) and school (26 percent) the top places to do so. Selfie nation: Nearly nine in 10 (85 percent) Hispanic respondents say they take selfies, compared to 71 percent of non-Hispanics. Emoji engagement: More than four in five (81 percent) Hispanic consumers admit to using emojis, and nearly one in five (19 percent) say they use them in every text. Read the room: More than half (54 percent) admit they call or text someone when they’re in the same room, notably higher than non-Hispanics at 36 percent. Plugged in to politics: The vast majority (68 percent) of Hispanics cite they are using their smartphone to engage with the upcoming election cycle in some capacity, compared to less than half (47 percent) of non-Hispanics. With more than 21 million active mobile users and growing, Bank of America’s mobile banking platform is an evolving source of increased customer engagement and satisfaction. During the second quarter of 2016, mobile banking customers logged into their accounts more than 900 million times, or approximately 47 times per user. During that same period, customers made more than 25 million mobile bill payments and nearly 80 million transfers, a growth of 30 percent and 46 percent, respectively, over 2015. Customers also used their mobile devices to deposit more than 280,000 checks daily and to schedule 22,000 appointments per week with a personal banker or financial center specialist, and were able to use their smartphone at more than 2,800 cardless ATMs to withdraw cash. More customers are opening new accounts through mobile, with sales increasing by 48 percent over the past year. Braun Research, Inc. (an independent market research company) conducted a nationally representative telephone survey on behalf of Bank of America March 29‒April 12, 2016. Braun surveyed 1,004 respondents throughout the U.S., comprised of adults age 18+ with a current banking relationship (checking or savings) and who own a smartphone. The survey was conducted by phone to a dual-frame landline and cell. In addition, an oversample of Hispanic consumers was conducted to bring the total number of surveys with this demographic group to 575. The margin of error for the national quota of n=1,004 is +/- 3.1 percent, and the margin of error for the Hispanic oversample (where n=575) is +/- 4.1 percent, with each reported at a 95 percent confidence level.